BC’s most glorious and favorite tree, the Arbutus or Madrona Tree, constantly inspires and challenges me. Each time I discover a forest fall down or dead branch or tree, I always wonder what it will look like when I open up the wood. Arbutus has perhaps the widest range of wood coloring of any tree on the planet ... from white to almost black with every shade of brown and red in between. 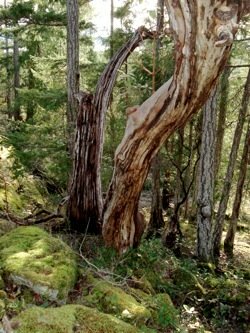 Add the glory of the burls and roots and Arbutus will defy your imagination that what you see can come from one species. Sometimes it is only at the end of a long process of sanding and polishing with its first application of oil that the rarity of the wood grain bursts forth! I am lucky that the type of designs I create can use relatively small pieces so that these rare grain colors and textures can be shown. The challenge for me is to allow the exquisiteness of the wood to be best revealed in the designs I create. At the same time, each piece blends the elusive perfection of design, art and function in these Arbutus wood crafts for sale. Lovers of the culinary world will find wood salad sets and salad hands, butter knives, wood servers of all kinds and delightful wooden cooking spoons. Because of the hardness of Madrone wood, the Culinary Collection will last and last. These non stick utensils made with a food safe wood finish have delighted thousands over the years and especially those born with left handedness (left handed products are so hard for them to find!). My Mum was a one of those left handed people. She was the inspiration for the business! I wanted to make her something for her birthday. I had just started to trim a piece of Arbutus wood with my axe for my first wood turning hobby here on Cortes. The scraps looked so gorgeous that I grabbed one and shaped it into a very simple letter opener for her. And so began my foray into primitive wood crafts! The Madrone tree’s special features define my work allowing a striking array of diversity in style and color. 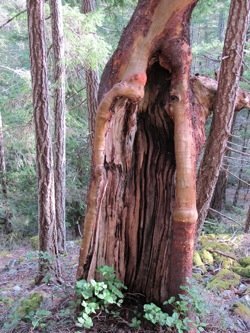 “The Arbutus tree’s wood has such a wide range of colors and textures, and, because of its hardness, it finishes to the smoothest of smooth. It is easily the winner as my favorite wood.” ...so sayeth Ron Bazar! Hand-crafted overlooking Desolation Sound on Cortes Island in British Columbia, Ron Bazar salvages his wood from forest fall-downs and dead branches and trees. Each created piece is totally unique following the natural shape of the wood – some for left handed people and some for right. Born in Montreal, Ron has had varied careers as entrepreneur, business consultant and writer and publisher of children’s books. He first came to Cortes in 1984 and moved there full time in 1998. He has been a hobby wood turner on and off since he was 12. Trust For Sustainable Forestry... Trust For Sustainable Forestry. Arbutus is unique among West coast North American hardwood species for its many superior qualities. It is worth its weight in gold as a medium for fine wooden sculptures, wood turnings, and wood jewelry with natural finishes. Its rich, varied grain and tones and excellent finishing characteristics rival those of any tropical imported hardwood. There is no finer exotic hardwood to be had in Canada or the United States. Chosen for the rarity of the wood and elegance of the design, form meets function in the Arbutis culinary tools, wooden pendants, unique desk accessories and wooden sculptures that Ron shapes. The pieces are polished to an exquisitely smooth finish to honor the beauty of the wood. This functional art demonstrates the spirit of Arbutus, capturing the essence of its native British Columbia in pieces designed to bring this beauty into the home. I couldn't decide where to add this poem, whether here or in Tree Poems. Even though it mentions the Arbutus tree, I decided to put it here as it is such a personal poem. It was written by my very dear friend and buddy Ron Trainor on his last visit here about a year before his untimely death in September 2008. I am humbled by his insights and this genuine heartfelt tribute that he wrote. It just poured out of him in a moment's inspiration. Ron was truly incredible that way. I always remember him. It's all over, and did you really live? As Ronnie would tell you, that's life's greatest thrill! ...on his last visit to my home in Tiber Bay, Cortes Island B.C. Ron was an amazing man, gifted poet, insightful and highly creative businessman and a best friend and biz partner for many many years. He passed away too early at age 60. 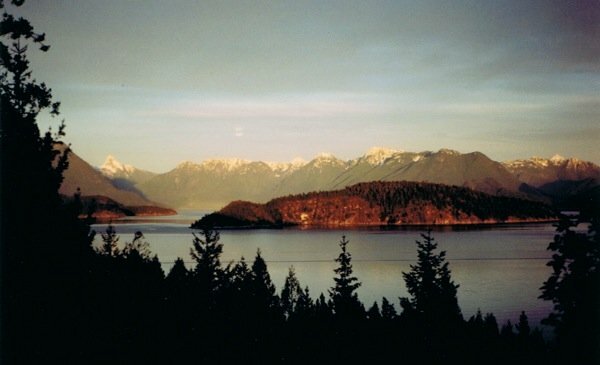 This view of the sea and Desolation Sound always thrilled Ron. He just loved visiting!He would sit out on the bluff and watch the birds and boats, always with a smile on his face.